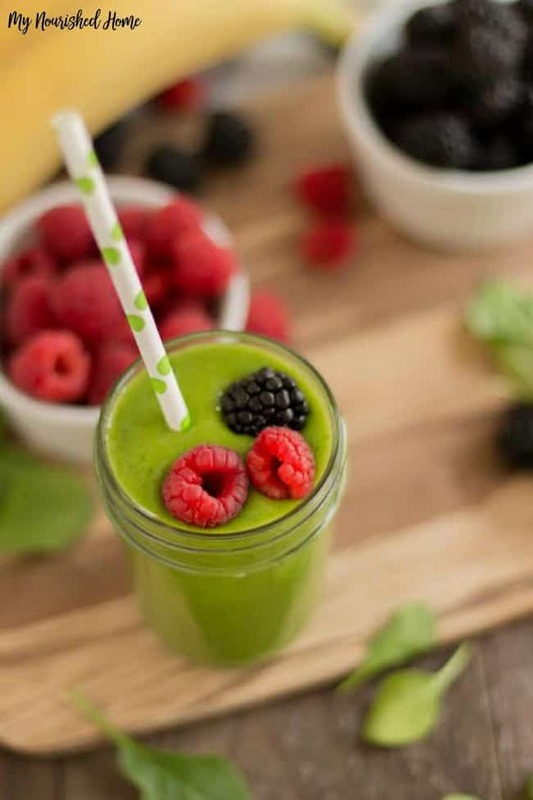 This green mango banana smoothie is the perfect way to start off the day. It is also perfect for that mid-afternoon snack. Like most families, we are busy. Getting up early for school, heading off to after school activists and more. 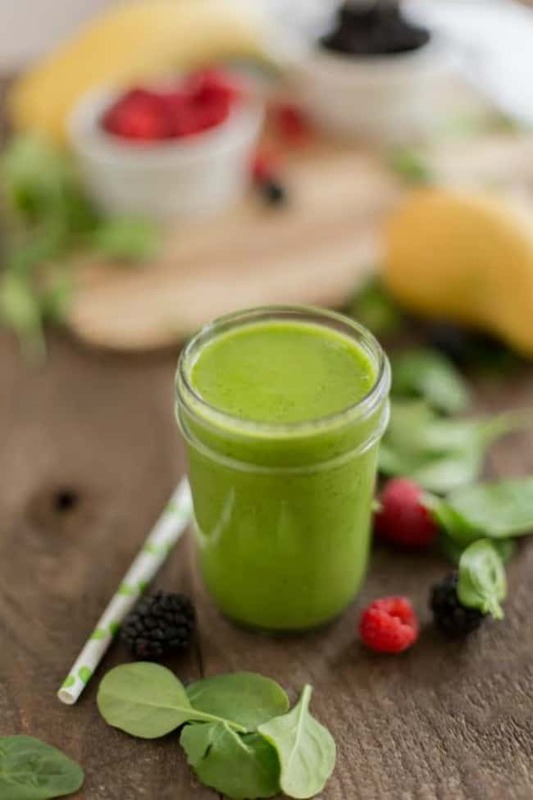 Having a fantastic smoothie recipe that my whole family loves is an easy and quick way to pack some vitamins in their day. Making sure my family gets the recommend amount of fruits and vegetables can be a challenge. With this green mango banana smoothie, I don’t have to worry any more. My kids are happy to grab one and will even race each other to see who can drink it faster. I guess brain freeze is fun when you are young. 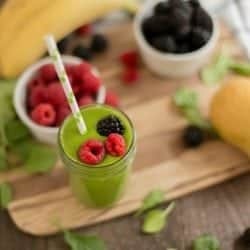 My kids enjoy getting in the kitchen and making smoothies, so I make it easy for them. When we are in the grocery store, I let them help me pick out the ingredients needed for their smoothies. At home, they can help me place all of the ingredients in a bag and place the bags in the freezer. Of course, the best part is turning on the blender (what is up with kids and noise?) and pouring the delicious smoothie in a favorite glass and adding a fun straw. This healthy mango smoothie recipe has kale which is high in vitamin sA, C and K and is full of antioxidants. Kale is also an anti-inflamitory food which can help those who deal with arthritis, asthma and autoimmune disorders. 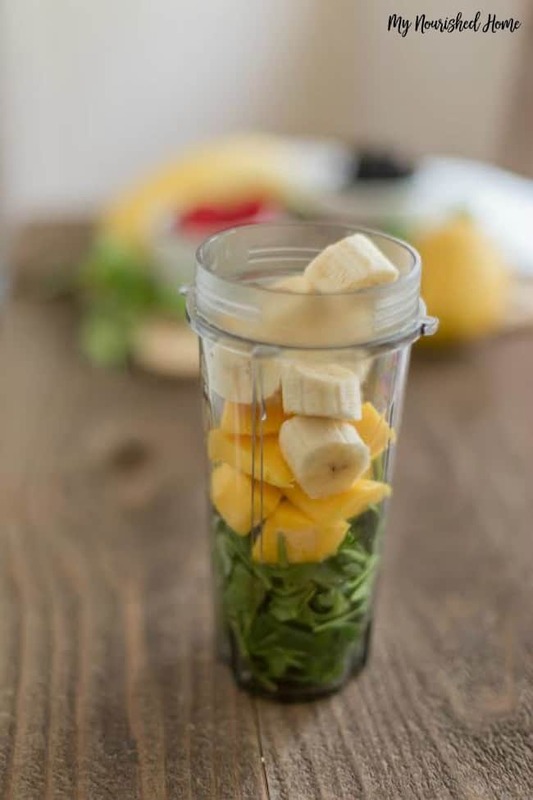 Mangos give the smoothie a sweet taste and the banana gives it a creamy texture. Both of these fruits are high in vitamins and are fruits my kids love. I know my little ones will go for the sweeter flavor every time. I always add whole milk to my green mango banana smoothie. The protein that is added by using whole milk is important to me. I know my family will get the boost they need to keep them going through their busy day. Creamy and delicious, a great way to start the day. Just blend everything until smooth. Enjoy immediately.